An exceptional all around athlete in basketball, football, and baseball, Mark Maye came back from rotator cuff surgery to turn things around for the Tar Heels in 1986. In his first start he’d break a school record throwing for 311 yards. Over the next year and a half, Mark broke that school record 3 more times, including a school record 406 yards and 4 TDs in a 30-23 win over Georgia Tech. Maye finished as the school’s second leading passer in history. 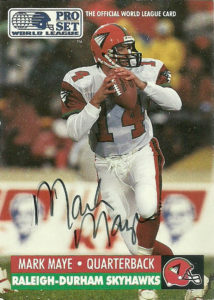 Going undrafted in 1988, Mark was signed by the Tampa Bay Buccaneers and spent the season as the 3rd string QB. Due to injury Mark spent his 1990 back at his Alma Mater helping out the Tar Heels’ coaching staff. Mark opted to play in the WLAF in 1991. He’d be selected in the first round by his home state Raleigh-Durham Skyhawks. It seemed like a perfect match, and Maye was the uncontested starter in camp. After an underwhelming opener against the Sacramento Surge ended in a 9-3 loss, Mark was injured during a brutal hit in Week 2 against the Orlando Thunder. He’d be placed on season ending injured reserve and essentially his football career was over. The Skyhawks didn’t really have a good offensive line or a back up QB plan. Joe Pizzo and Bobby McAllister battled it out the remainder of the season, but the franchise finished a woeful 0-10. After the season the franchise was dissolved and replaced by the Ohio Glory. Mark lives in North Carolina. I’ve tried him twice now at least with no such luck. The first time I got a body bag from the USPS. The second has been in the mail for sometime. At this point I just threw up my hands and decided to take a shot. Seeing a WLAF autograph on an auction site is a rarity, so I just took it at face value that this one was authentic.